Have you heard of accommodating resistance? This term refers to the unyielding resistance the bands impose on the body as we use our own optimal mechanics and awareness to create movement and therefore forces. Each movement has a range of motion (ROM) component, whether it’s a bicep curl, squat, or warrior 3 to half-moon pose. Within that ROM there are multiple systems at work, the instructing and organizing of the nervous system/brain, the mechanics of the skeletal system and joints, and the force generation of the muscular system where certain muscles are stabilizing, others are mobilizing, shortening, and lengthening. Intelligently placing the resistance bands on the body during the movement creates accommodating resistance which influences all of these systems. Within the muscular system specifically, if we are working with the body is appropriately stacked and moving in and out of neutral joints than we can access, educate, and strengthen the “weaker” or less efficient areas of those muscle firing. Because this resistance is accomodating and unyielding, the muscles will strengthen both eccentrically (while lengthening), not just concentrically or shortening. The added resistance will help generate increased force and power in those ranges. Ever feel like you aren’t using the right muscles to stabilize during movement? Maybe your low back muscles are really tight or you have a lot of tension in your neck with plank. This could be a case of your deep stabilizing system not working to its most efficient and supportive role during movement. Resistance bands placed accurately, and cued well to the individual’s needs can provide valuable feedback and force for the deep stabilizing system to work against. This constant force educates and helps recruit the abdominal core, shoulder stabilizers, or hip stabilizers to work against throughout a range of motion and/or functional movement. In this example, Giulia is using the resistance band to cue her transversus abdominis to co-contract with internal/external obliques and multifidus together in order to stabilize the pelvis, spine and trunk into her version of neutral. This can aid in creating space and arthrokinematics that allow for optimal spine and hip mobility. Using techniques like this can be extremely useful when dealing with injury, injury prevention, or instability around the hip joint. To be specific, when dealing with chronic hip injury, one of the largest obstacles that physical therapists tackle is neuromuscular timing. Which muscles turn on first during movement, and do they have endurance to remain on to stabilize the joints involved? Resistance band techniques like this can have enormous benefits for injury sufferers when done appropriately. Have you heard the term smudging? Coined by Dr. David Butler, it refers to changes that happen in the brain often in response to chronic pain. The corresponding body part (for example, the hip’s) representation in the motor cortex becomes less differentiated, more blurry, and can be smudged and “blended” with other body areas. Movement in that area becomes less fine, accurate and differentiated. These changes occur within motor homunculus or cortex. The homunculus is a representation of the physical body within the brain where motor outputs arise from. Representation is larger if the body part is used often and has high level of differentiation of movement and sensation, finger representation is larger than hips/trunk. To illustrate this concept, let’s think through chronic hip pain and and smudging that would occur. The hip is one of the smaller regions represented in the homunculus (since it does very little fine motor activity), and has a low density of proprioceptors (the sensory receptors like ball-bearings that tell us where we are in space), making it a tough area to rehab. It’s often hard for those with chronic hip pain to “find” their glutes or deep 6 rotator cuff muscles, this is in part why. Those muscles are responsible (along with other surrounding muscle groups) for centering the hip ball and protecting it in the socket. Underuse, inadequate timing and/or firing of use of these muscles, can lead to hip joint injuries during loaded postures and transitions like high lunge to warrior 3. Simply performing the transition without an external force may not solve the problem of recruiting and unsmudging. 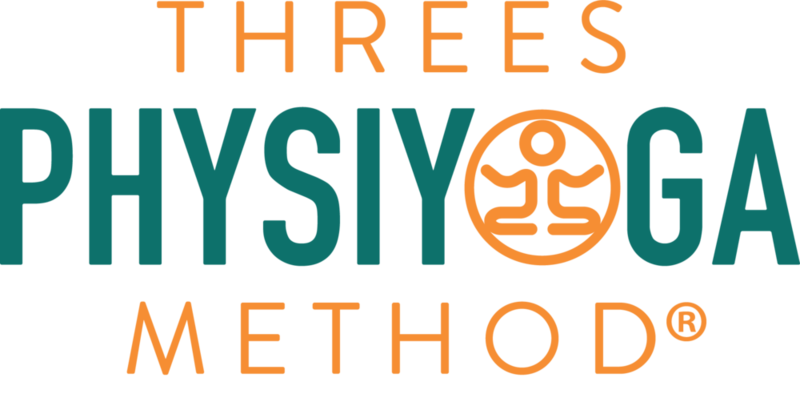 In this video, Threes Physiyoga Methodtm teacher, Giulia Pline shows several ways to use resistance bands to add load and change forces to increase awareness and recruitment within the hip muscles. Using the resistance bands helps to heighten focal awareness and muscular challenge which i will generate brain differentiation and pathways through neuroplasticity. Yet another Physical Therapy based rationale for utilizing resistance bands in yoga asana to benefit those with pain, neuromuscular changes, and strength deficits. Viva la resistance!